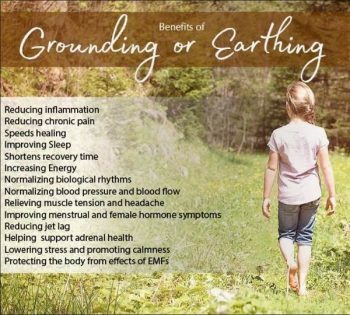 “Earthing,” also known as “Grounding,” is a pseudoscientific belief that claims electrons continually flow back and forth between the earth and our bodies and cure or alleviate almost every disease or affliction known to man. It’s pretty much a lot of bunk. According to Earthing proponents, you can ground yourself by walking outside barefoot or by being connected to the earth via grounding devices that transfer electrons from the earth to your body. Supposedly, electrons drawn into the body from the earth neutralize damaging free radicals and by extension reduce disease-related chronic or acute inflammation. 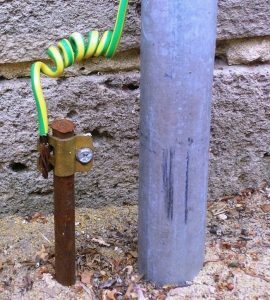 The standard and traditional definition of “grounding” or “grounded” has always referred to an electrical conductor placed directly into the ground or earth to protect consumers from electrical shocks should a failure of internal insulation occur in a household appliance or to provide a path to discharge any static charge that could damage certain sensitive electrical equipment. There are several other common meanings for “grounded.” It can refer to a person who is mentally and emotionally stable. It can also refer to being prohibited or prevented from flying, such as a pilot or aircraft. The word can also refer to someone being confined to stay inside, typically by a parent, as a punishment. In the last ten years or so, the common terms “earthing” or “grounding” (not capitalized) have been exploited for the purposes of advancing the pseudoscientific hypothesis known as “Earthing” or “Grounding,” and the words are usually capitalized for that purpose. The Earthing/Grounding hypothesis has never been proven scientifically (using real unbiased scientific methods), nor can it be. It’s based mainly on a lot of speculation and wishful thinking. 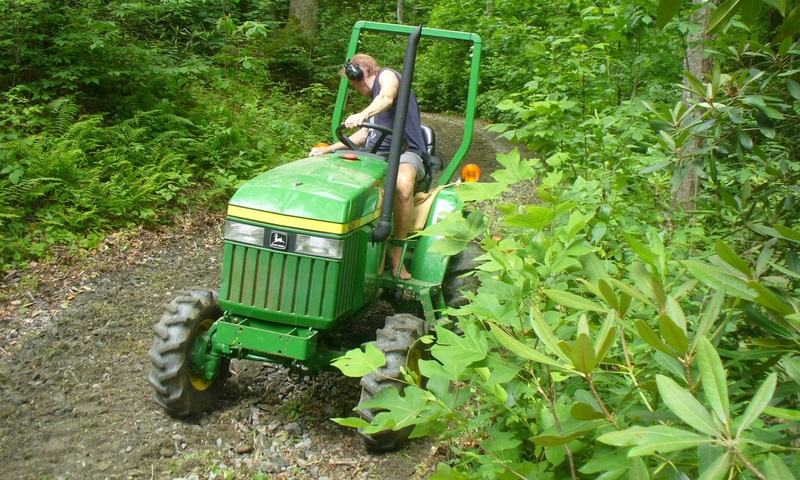 The whole premise of Earthing is based on a misunderstanding or ignorance of physics as well as chemistry and biology. It is almost certainly people seeing what they want to see, and mistaking anecdotes for data. If it truly were based on actual unbiased scientific tests and studies, then there would be universal acceptance of it, and there isn’t. Apparently, a lot of people read the Earthing claims and believe them (these are also people who generally will believe anything they read, especially on the internet). Then they take off their shoes for the first time and go walking barefoot on the bare earth. Yes, it feels great to them! Earthing must be working, because they’ve been told it does, and they believe it. Not only that, the more they do it, the better they feel. All their aches and pains go away and they sleep better. It’s a classic placebo effect. They don’t realize just going barefoot makes them feel good, no matter where – it doesn’t need to be on the earth. Electrons going back and forth are having nothing to do with it. That “something” he later realized was that humans have a bio-electrical connection to the earth, but that connection in and of itself was not necessarily a good thing. It could cause people all manner of problems unless they were in a constant state of being grounded to the earth (kind of like appliances). He postulated that without the healing power of grounding, the human body would continue to suffer various ailments, including inflammation and other maladies. He spent the next several years researching and talking to anyone who would listen in an effort to try to prove or find plausible explanations that would back up his hypothesis. Then in 2010, feeling he had enough information to convince people he was right, Ober, along with a couple of fellow believers, Stephen Sinatra, MD; and Martin Zucker, published a book entitled, Earthing: The Most Important Health Discovery Ever? It also included a foreword by James Oschman, PhD. The book wasn’t exactly a best seller, listed by Amazon as number 528,230 in all books sold, and number 858 in the category “Books, Health, Fitness & Dieting, Alternative Medicine, Energy Healing”. But Ober sold enough to stir some interest in those who are into the various alternative medicine claims. One group that also had some particular interest was the barefooting community – people who go barefoot as much as they can or even all the time as a lifestyle. The reason it appealed to many of them was that the book advocated going barefoot as the simplest way to be grounded. In 2014, Ober and his crew published a second edition, adding 66 more pages, and changing the question mark on the subtitle to an exclamation mark, as Earthing: The Most Important Health Discovery Ever! If you do any research about Earthing on the internet, you’ll see the same four names associated with the book consistently popping up, along with three others who have also jumped on the Earthing bandwagon, Gaétan Chevalier, PhD and Polish father and son Karol Sokal, MD, PhD and Pawel Sokal, MD, PhD. These are practically the only people with any credentials to speak of that have ever backed this Earthing hypothesis, and their names are consistently associated with almost everything ever written or videos produced promoting Earthing. They claim to have “real scientific studies” to bolster their beliefs, but these are unconvincing to anyone with a modicum of scientific or medical education or expertise. They involved small numbers of subjects and usually failed to use any standard scientific controls. Almost all were funded by people with a vested interest in selling Grounding products. That article and its referenced resources are typical of the kind of worthless studies designed to generate false positives, similar to the “in house” studies that companies sometimes use so that they can claim their products are “clinically proven.” The individual studies cited are little more than documenting placebo effects, subjective findings, and bias confirmation. Plus the conflict of interest among the authors is glaringly obvious. It’s all the work of a few closely associated true believers who are basically operating a scam. Lowers stress and promoting calmness by reducing stress hormones. Pain, disease, and other disturbances are often caused by chronic inflammation. Such inflammation is, in turn, caused by positively charged molecules called free radicals. When you make direct contact with the Earth, either by being barefoot outside or using an Earthing product indoors, electrons from the Earth enter your body and reduce the free radicals and inflammation. There is not one shred of evidence that backs up that statement. Free radicals are the natural byproducts of chemical processes in the body, such as metabolism. The problem with them, according to Rice University, is once they are formed, a chain reaction can occur. The first free radical pulls an electron from a molecule, which destabilizes the molecule and turns it into a free radical. That molecule then takes an electron from another molecule, destabilizing it and tuning it into a free radical. This domino effect can eventually disrupt and damage the whole cell. Antioxidants are what keeps free radicals in check. Antioxidants are molecules in cells that prevent free radicals from taking electrons and causing damage. Antioxidants are able to give an electron to a free radical without becoming destabilized themselves, thus stopping the free radical chain reaction. If you were to believe what the Earthing/Grounding proponents are telling you, going barefoot may indeed be doing more damage to your bodies than making us healthier. If all these electrons going back and forth as we touch the earth with our bare feet are somehow neutralizing all the free radicals within our body, then our immune system may be suffering as a result of that. …reducing free radicals is not a panacea. Free radicals are part of normal physiology and are used not only as part of the necessary function of the immune system but in many regulatory systems. Suppressing free radicals may therefore cause more harm than good. Of course that’s not really happening (Earthing/Grounding electrons neutralizing free radicals), so we don’t need to worry about that. Earthing proponents claim that when you are grounded (bare feet touching the earth, or using one of their grounding products they’re happy to sell you), electrons flow up out of the earth and into your body making you feel wonderful and curing diseases. At the same time, “bad” electrons are flowing out of the body and down into the earth. They do not explain how electrons can flow both out and into the earth at the same time. It is generally agreed among physicists that the surface of the earth usually has a slight negative charge – so small it’s almost unmeasurable. That charge varies somewhat depending on weather conditions, but for all practical purposes, the earth’s surface is electrically neutral. Otherwise, how could grounding a home’s wiring system or appliances possibly work? The planet Earth is electrically neutral, more or less. There is always a slight imbalance, but it is self-correcting, as the Earth is continuously exposed to the solar wind, which contains both positively and negatively charged particles. So if the Earth, say, had a small net positive charge, it would repel many of those positively charged particles and attract the negatively charged ones, which would neutralize the Earth’s charge. Same thing if the Earth had a small negative charge. So apart from such minor fluctuations, the Earth is electrically neutral. Therefore when people do make a direct contact with the earth with their bare feet, that can have a grounding effect (small “g”). If anyone did have excess electrons in their body, due to static electricity, they would flow into the earth, certainly not in the other direction. The human body would have to be positively charged (an extremely unlikely scenario) for electrons to actually flow up from the earth and into the body. Negative electrons as a rule would never flow from the earth to enter anything or, in particular, any human being. I’m not aware of any way a human being could normally ever be positively charged, a condition necessary to attract negative electrons into the body. Human beings sometimes become negatively charged due to a temporary build up of static electricity, but that will quickly discharge into the relatively more positively charged earth, usually causing no harm at all (other than a potential spark and annoying shock). Going barefoot keeps people healthier than wearing shoes for a variety of reasons, but none having anything to do with some hypothetical electron flow back and forth. Once the Earthing nonsense started becoming more popular with book sales and aggressive internet promotion, another player decided to jump in and take advantage to make a few bucks, Dr. Joseph Mercola. If Mercola is involved in it, it’s most likely a scam. Mercola’s medical claims have been criticized by business, regulatory, medical, and scientific communities. A 2006 BusinessWeek editorial stated his marketing practices relied on “slick promotion, clever use of information, and scare tactics.” In 2005, 2006, and 2011, the U.S. Food and Drug Administration warned Mercola and his company that they were making illegal claims of their products’ ability to detect, prevent, and treat disease. The medical watchdog site Quackwatch has criticized Mercola for making “unsubstantiated claims [that] clash with those of leading medical and public health organizations and many unsubstantiated recommendations for dietary supplements. The only part of that paragraph that has even a modicum of truth is the first sentence, and even that is misleading in its wording. As explained earlier, the surface of the earth does generally have a very small, almost unmeasurable, negative charge depending on weather conditions, but for all practical purposes, the earth’s surface is electrically neutral. But then Mercola’s next two sentences make no sense at all. Even if, as he says, the earth does have a negative charge, regardless of its magnitude, how could these electrons be “conducted to your body”? Electrons flow FROM negatively charged matter TO positively charged matter. Human beings would have to be very strongly positively charged for the earth’s electrons to flow in the reverse direction of their normal flow, and that is likely to never happen. According to National Geographic, cloud-to-ground lightning bolts are a common phenomenon, with about 100 of them striking somewhere on Earth’s surface every second. Clouds can become negatively charged and at some point under the right conditions will discharge their electrons, either from cloud-to-cloud or from cloud-to-ground in the form of lightning. This is essentially the same process as humans releasing static electricity in the form of a spark if they touch something that is less negatively charged than their skin is at that moment. Thunderclouds form when droplets of water in the cold, upper parts of the atmosphere freeze solid and fall. At the same time, updrafts carry water vapor up. The friction of falling and rising water droplets in clouds bumping into each other cause electrical charges to build up. The lighter, positively charged particles form at the top of the cloud, and heavier, negatively charged particles sink to the bottom. Thus, the thundercloud is negatively charged on the bottom and positively charged on top. As the thundercloud moves over the surface of the earth, an equal electric charge, but of opposite polarity, is induced on the earth’s surface underneath the cloud. This induced positive surface charge is a temporary change to the usual neutral or slightly negative charge on the earth’s surface, and will dissipate as the thundercloud passes on. Once a strong enough negative charge builds up at the bottom of the cloud, the negative electrons will jump to the positively charged earth all at once in the form of a lightning strike. But a strike isn’t quite as simple as that. High resolution photos and videos of lightning strikes actually show it going in the opposite direction, that is from earth to the clouds. So, how can that be, and which way does lightning actually flow? Both ways actually. Cloud-to-ground lightning does come from the sky down, but the part you see comes from the ground up. Confusing? Not really. A typical cloud-to-ground flash lowers a path of negative electricity (that we cannot see) towards the now positively charged ground and objects on the ground in a series of spurts. Since opposites attract, an upward streamer (a positively charged ionic channel) is sent up from the ground or object about to be struck. When these two paths meet, a return stroke zaps back up to the sky. It is the return stroke that produces the visible flash. But it all happens so fast – roughly in about one-millionth of a second – that the human eye doesn’t see the actual formation of the stroke. So what does this have to do with Earthing? Nothing directly, but hopefully helps put the natural electrical charge of the earth into realistic perspective. Lightning activity is the only time electrons ever naturally flow upward out of the earth. That will never happen under normal circumstances to a person when he or she is walking around barefoot. That is, unless that person is actually being struck by lightning. 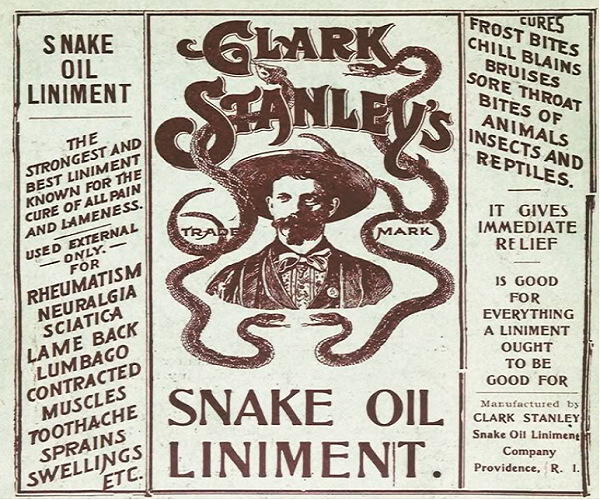 In late nineteenth and early twentieth century America, snake oil was commonly promoted and sold as a cure-all for almost everything, not unlike the claims of Earthing proponents today. 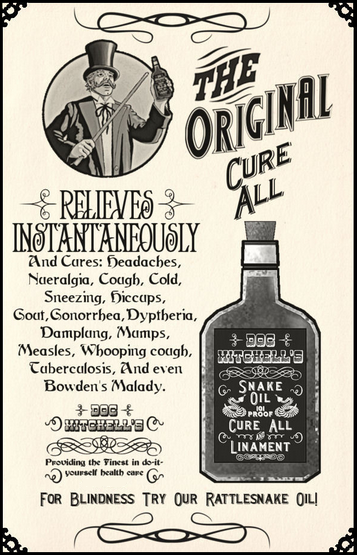 Snake oil was u sually produced by boiling rattlesnakes and skimming off the oil that rose to the surface. Unfortunately, rattlesnake oil did not contain the abundance of omega-3 acids of the original Chinese snake oil it was trying to emulate. And hucksters often found it cheaper and easier to substitute other oils for real snake oil. So basically it was almost worthless as a cure for anything. Yet it was highly touted as a cure for almost any ailment. Similarly, the proponents of the Earthing belief or hypothesis have convinced a lot of people that it’s all true. The belief in it and promotion of it have become almost like a religion, which is being proselytized all over the internet. People who believe in it say going barefoot while touching the earth makes them feel so much better. Of course going barefoot makes anyone feel better, directly on the earth or anywhere else, but that has nothing to do with electrons flowing back and forth, their influence on free radicals, or any of the other medical or biological terms Earthing promoters throw around in their propaganda. No, human beings don’t need to be grounded to the earth like household appliances to function normally and healthfully. Does it really matter if people believe this nonsense if it inspires them to go barefoot? Some would say that even if Earthing/Grounding is only an unscientific hypothesis, if it encourages people to become healthier by going barefoot, there’s nothing wrong with that. Yes, that justification is often heard from people. Let them just be happy and enjoy their ignorance, as what harm can it do? Which, I guess from some perspectives, has merit. My view is that barefooting groups espousing that phony science or freely allowing it to be promoted tend to make barefooters look even more out of the loop of reality and common sense than just the more ordinary reasons the public sees barefooters as strange. My goal is and always has been to help the public see barefooters as just normal people, no different from the average person, other than their free will choice to not wear shoes. That choice should be looked at as no different from a choice to not wear a hat or similar article of clothing. Public promotion of Earthing/Grounding as the reason we go barefoot just makes us look kind of seriously uninformed, gullible, and weird. Since going barefoot – anywhere, not just on the earth – is one of the most natural, normal, and comfortable thing for human beings to do, it obviously is going to make them feel good to do it. And in the long run, is going to make their feet as well as their whole body much healthier and pain-free than had they continued to wear shoes. If they want to attribute that to some kind of Earthing effect, they are certainly free to do that. To me it feels great to walk barefoot anywhere – whether on bare ground or some place like inside a store. The real problem is that, as I mentioned, the vast majority of not only scientists, but just people in general (if they’ve even heard of it), look at this Earthing thing as some kind of silly new-age fringe nonsense. To promote it on a barefooting site or in articles about barefooting sends the message that we’re all a bunch of kooks. That is not the message we need to be sending to the world, mostly of whom already think we may be a little crazy. Earthing promoters spend hundreds of thousands (possibly millions) of dollars on promoting their ideas and products online, including many slick and well-funded videos that are designed to be very convincing, especially to the uninformed or gullible. It’s often hard to compete against that kind of economic power for people with limited or no funds available in efforts to get the truth out to the public. But many are trying to do just that. A web search for “earthing debunked” or similar wording will bring up dozens of resources, sites, and articles that help expose this pseudoscience for what it really is. Here is a list of just a few good ones that I found. Most go into a lot more detail than I have been able to in this article. This was truly excellent. I thank you for the lightning facts and that was quite fascinating!